The District Department of Transportation has recognized TCG as a “transportation leader” in the city for offering staff flexible work schedules, telework options, and its adoption throughout the company. The goDCgo Ambassador Award was presented to TCG at a ceremony in Georgetown on March 29, 2017. Since TCG’s inception, the company has endorsed a telecommute-first model, where leadership prefer and advocate for employees to work remotely whenever possible. As of September 2016, 74% of TCGers telework at least one day per week and more than 50% telework five days per week. Since 95% of staff live in the DC metro area, TCG’s telework model keeps a lot of cars off the road, conserving approximately 42,000 gallons of fuel each year. For those TCGers who must work on-site with clients, the company provides mass transit benefits, paid bikeshare membership, and reimbursement for the cost of shoes — an additional means of fuel conservation. “Commuting tends to waste time and it’s bad for the environment. When our clients are comfortable with our staff working from home, we do. Since most people are more productive when they work from home, it’s a win for the client, a win for staff, and a win for the environment. Everyone is happier, and that makes me happy,” said TCG President Daniel Turner. 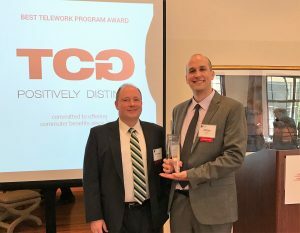 This is TCG’s first time receiving the goDCgo Ambassador Award and the second award for its telework program.